Guatemala’s own celebrity chef, Mirciny Moliviatis, joined my private tour along with her father, Demetrius, who personally escorted us through the department of Petén, where he grew up and also served as a politician. Her knowledge of the cuisine and the land has come as a profound surprise—this was a life changing adventure. The gastronomy of Guatemala is rich in street food traditions; there are a wealth of cultural moles (chile based stew), pepianes (pumpkin seed based stews), stews; fantastic rum, beer and other beverages; and the country is the Mayan center of gastronomy with a wealth of herbs, vegetables, chiles and wild game. Each region of Guatemala contributes special cultural dishes: pepian antigueño from Antigua, tapado from Livinston, tamal de arroz from Chichicastenango, pecari and tepezquintle from Peten, and jocón from the occidental region of Guatemala. In the capitol you’ll find street food: tostadas with a wide selection of delicious spreads, mole de platano, enchiladas, desserts, tamales, Guatemalan hot dogs (called shucos) corn on the cob sprinkled with pumpkin seed powder, egg-battered vegetables called envueltos, chiles rellenos and ceviche. Over 50% of the population of Guatemala is Mayan, and can be seen dressed in the colors and designs of their subgroups—the government supports the culture and allows them to wear their cultural dress to work—many have become successful entrepreneurs like the women at San Juan La Laguna. Who’ve formed cooperatives to sell items like medicinal teas, or are producing oyster mushrooms for local restaurants. The basis for much of Guatemala's cuisine are its many colorful recados, or sauce bases that are used in its stews, tamales, soups and more. Many of the product used in the Guatemalan gastronomy are bitter, bitter flowers, herbs and vegetables that are balanced by savory recados and a sizable selection of regional chiles that are used for flavor and color, not for heat. Guatemala has only one beer company, El Gallo, but when the national beer is this tasty the limited choice means that all beer in this Central American country is good, and their rum, Ron Zacapa, just happens to be one of the most respected brands in the world. For those that love to travel to eat and explore Latin American cultures, here’s some of what you can look forward to in Guatemala, the Land of the Eternal Spring. Tostadas are the principal street food in Guatemala, like tacos in Mexico, pizza al taglio in Italy and oyster omelettes in Taiwan, and distinguish themselves from tostadas in Mexico by their osculating disc shape. The tostadas are served with a variety of spreads: pasta de pollo (chicken paste), guacamol (avocado spread), picadillo de carne (ground meat with vegetables), chojin de rabano (chopped radish salad), ensalada rusa (Russian salad or potato salad), salpicon (ground meat cooked with lime), frijol (beans), carne molida (ground meat) and the people's choice, Guatemalan-style chow mein, among many others. Street vendors also sell the mother of all tostadas, the enchilada, a tostada stacked with the works: picadillo, pickled beets and cabbage, tomato sauce, and slices of hard boiled eggs. Street corn comes dressed in butter, pepitoria (ground pumpkin seeds) and cheese; sweet mole de platanos (banana mole) as also a must from the ample spread found at the street vendor tables. Other typical snacks include rellenitos (sweet bean stuffed plantains), tacos (rolled fried tortillas filled with meat), envueltos (vegetables in egg batter) and chiles rellenos, panes (sandwiches) and buñuelos (fried dough balls). Shucos, or Guatemalan hot dogs are best had near the Liceo Guatemala University where special toasted buns are filled with mayo, ketchup, mustard, guacamol, split hot dogs, sauerkraut, and even sliced ham or bacon--put all these tasty ingredients in a corn tortilla and you have a mixta, Guatemala's hot dog taco. Guatemala has their own grilled meat tradition, called churrasquitos, and no visit to this Central-American gem would be complete without pollo y papas--fried chicken and French fries served with ketchup, the perfect late night indulgence. Besides mole de platano, Guatemala has savory moles, but their greatest expression of this pre-Hispanic practice of cooking is in the regional pepianes, made with a base of pumpkin seeds--each region has it's own recipe and tradition. Other classic dishes that you should seek out include: jocón (chicken in a green sauce), iguashte (pumpkin seed based dish), revolcado (pork offal in a tomato based recado sauce), pulique (meat stew), subanik (spicy meat and vegetable stew), kak'ik (turkey soup), gallo en chicha (rooster stew) and hilachas (shredded beef in stew). Mayan dishes are everywhere in Guatemala but a visit to Oaxactun--right next to Tikal, in the Petén department where the chicleros (gum harvesters) camp relies on foraged ingredients like coshan (palm hearts)and tzkinché (wild mushrooms) to survive while out on a job was a life changing meal. Pecari (wild boar) and tepezquintle (rodent) are delicious when barbecued--I enjoyed a tasty portion of tepezquintle at stand in front of a house in Oaxactun. In San Juan de la Laguna I enjoyed whole crab simply cooked with bitter, chipilin (herb), which is prime example of the rich flavors of Latin America before the arrival of the spice trade. (small river fish) were cooked in banana leaves in a well-spiced marinade. Guatemala has a variety of delicious regional tamales for special occasions and for any occasion; they are an important pre-Hispanic food and essential to the Mayan kitchen. The standard tamal is a hefty rectangle of masa cooked in a banana or Maxan leaf, filled with either meat, vegetable and herbs, or fruits and nuts, but there are hundreds of varieties like paches (potato tamales), chuchitos (tamales with sauce in a small corn husk), tamales de arroz (rice tamales), tamales colorados (colored by tomato and achiote), tamales negros (colored by chocolate, raisins and prunes), tamales de elote (sweet corn tamales), tamales de masa to use for eating dishes like pepian, tamalitos de chipilin (herb) and loroco (edible flower) tayuyos (bean tamales), tamalitos de cambray (raisins and almond tamales) and so may more that are either boiled or steamed. In the town of Livingstone live Guatemala’s Garifuna community--a diaspora of a cultural group exiled from the island of St. Vincent that settled in Belize, Honduras, Nicaragua and Guatemala. 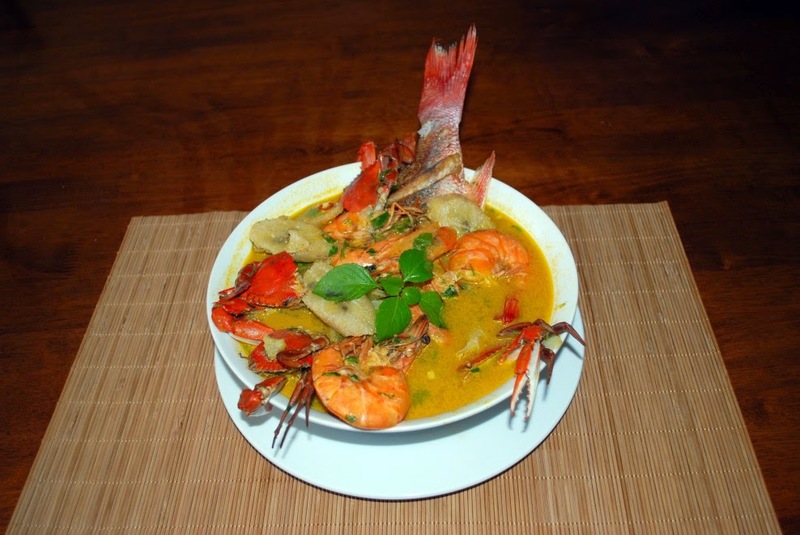 In Guatemala, the Garifuna serve a traditional plate known as tapado, rich, creamy coconut soup with a whole fried fish, a large prawn, and crab or whatever shellfish was freshly caught and a generous amount of plantains. Tapado is usually enjoyed with cassava bread, and if there's still room in your belly, try some of the inexpensive and delicious garlic prawns made by the locals. On this trip I ate well at markets in Antigua, Guatemala City, in the Petén department and Almolonga where stalls prepared a variety of typical dishes to keep you energized while shopping. Street food is great in the markets, seafood soups, comida de canasto (baskets full of cooked vegetables for eating with tortillas), a world of egg-battered and fried foods and the many comedores serving regional dishes. And of course, each market carried the coveted products of each local population: chiles, produce, seafood, meat, poultry, seeds, sausages, herbs and spices. Ceviche stands are popular at markets and street carts for a limited selection of local seafood products like concha negra (black or bloody clams), sea snail, shrimp and land clams: raw bull's testicles known as creadillas are prepared in a cocktail of vegetable juice, lime juice, cilantro, tomato, onion, and mint. At Antigua's famous Hugo's Ceviches, you can get delicious ceviches and picositas, beer cocktails served in the can wrapped in a fitted paper bag. Seafood stews are thickened with Guatemalan cream like piguas (large shrimp) or a mix of fish and shellfish. Guatemala has a small group of chefs doing contemporary Guatemalan cuisine--the leader of this group is chef Mirciny Moliviatis who runs a small, upscale franchise, 7 Caldos, named after one of Guatemala's provincial chiles. 7 Caldos is a must and the only place in Guatemala City where you can get such delicious regional dishes such as subanik, ka'kik and jo'com. Stay tuned for more detailed reports on Guatemala and learn why I believe this is a cuisine to watch in Latin America, the greatest Mayan tradition in the Americas, and the best cuisine in Central America. Thanks to Inguat, Mirciny Moliviatis, Demetrio Moliviatis, Javier Rosales and all the people who helped me realize this trip to Guatemala, a place that had been high on my short list of Latin American countries to visit, and a place that will remain one of my favorite food destinations in the world. Unreal. That all looks so good. Thanks for sharing. What an amazing gastronomic tour you enjoyed! Thanks for visiting and feel free to come as often as you feel like. Great article highlighting the delicious flavors of Guatemala! My cousin (a Guatemalan currently living in Albania shared this on Facebook) and I was really excited to stumble upon. I am extremely passionate about travel, particularly in Latin American and even more so in Guatemala, the country that stole my heart :) I have blog www.lagringachapina.com that is centered on the positive promotion of Guatemala :) Check it out if you'd like!